The ensaimada, a typical artisan dessert dating back to the 17th century, is made from flour, sourdough, eggs, sugar, water and lard. The dough is rolled up into a long cylinder which is then wound up into a snail-like shape with two or more clockwise turns. The name "ensaimada" comes from the Catalan word "saim" for pork lard. Apparently the lard gives it a distinctive taste and texture. Many people now use butter in place of lard while making ensaimada, even though traditionalists still swear by lard. Majorca takes its ensaimada so seriously that they have a regulating council which has laid down very definite parameters regarding measurements of the ingredients used to make ensaimadas. Manufacturers of this sweet bread in Majorca have to maintain these standards, for approval by the country's regulatory council, in order to label their product "Ensaimada Malloorquina/ Ensaimada de Mallorca". 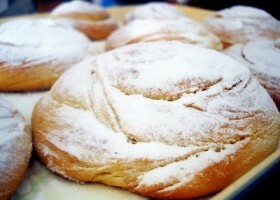 Ensaimadas come in many varieties these days, depending on what they are filled with. Two very popular ensaimadas are the "Llisa" or plain ones with no filling, and the "Cabell d’àngel" or angel's hair which is filled with candied stringy orange strands which found inside pumpkins. Combine the sugar and salt together in a large bowl. Gradually add the flour and warm milk mixture. Add the eggs and olive oil, mix well, and knead until soft and well-blended. The dough should be smooth and very elastic. All this can also be done in the food processor. Place the dough in an oiled bowl, cover with a damp cloth and leave to rise in a warm place for about 1 hour, or until dough has doubled in volume. Knead the dough again, and using a rolling pin, roll the dough as thin as possible over a floured surface. The thinner the dough is rolled out, the more layers the finished ensaimada will have. Dust lightly with flour, if necessary, to prevent it from sticking. Brush the entire surface of the dough with softened butter. This bread is supposed to be buttery so go ahead and use the butter stated in the original recipe. It makes all the difference. Start rolling the dough from the longer side, bit by bit, from one side to the other (as if you were rolling up a poster). When the dough has been rolled up, allow it to rest for 1 hour. If you would rather make this bread as smaller single serve portions, then divide the dough into four equal portions. Then follow the same method for rolling and shaping the bread, as mentioned above. Remember to reduce the baking time proportionately. I would suggest about 20 to 25 minutes should be alright, but please keep an eye on the bread after about 15 minutes. Transfer the coil to a greased baking sheet. Cover with an extremely large inverted bowl or bucket, large enough to ensure that the dough will not stick to the bowl's surface when it rises. Allow the dough to rise for several hours ( let dough rise for about 6 hours, though most recipes seem to recommend 12 hours!). Bake the dough coil at 190C for around 30 to 45 minutes, or until the top is golden-brown. This bread will brown quite a bit as it is a sweet bread. If you feel it is browning too much, cover the top with aluminium foil halfway through baking. Brush the surface with melted butter and sprinkle generously with sugar. Allow to cool. Cut the ensaimada into slices (like you would a round cake) and serve with hot chocolate, as traditionally done, or with coffee or tea.